Boosting your Cummins 5.9L beyond 450RWHP and keeping the working exhaust temperatures around the 1200 degrees F and at the same time keeping your truck street friendly can be a challenge. BD’s Twin Turbo kits are up for the challenge! For the Dodge truck owner who has his 5.9L diesel pushing between 425hp-575hp and yet wants to use his pick-up for daily driving, full-time RV’ing, weekend adventures or a little fun on the track, plus, keep the EGT’s low and economy high, then BD’s Super B Twin kits are the perfect fit. The Super B Twin uses a large Borg Warner Air Werks turbo as the primary which feeds the Super B Single we use as the secondary, compounding the air flow to deliver up to and beyond 60psi of superior boost pressure. The secondary turbo comes with BD’s own heavy duty waste gate kit and Turnbuckle for consistent pressure without “creep” and ease of adjustment. Included in the Super B Twin Turbo kits are our X-Intake system with a twin turbo air flow matched conical washable air filter, casted and machine matched turbine connection, powder coated mandrel formed intake pipes, oil return and supply fittings – some kits even include our pulse tuned exhaust manifold. Most kits allow the stock engine oil cooler to be left in place. For those Dodge owners who already have a Super B Single turbo and have increased their power or are having difficulty keeping the EGT’s low, we have upgrade kits to take your single to a twin. 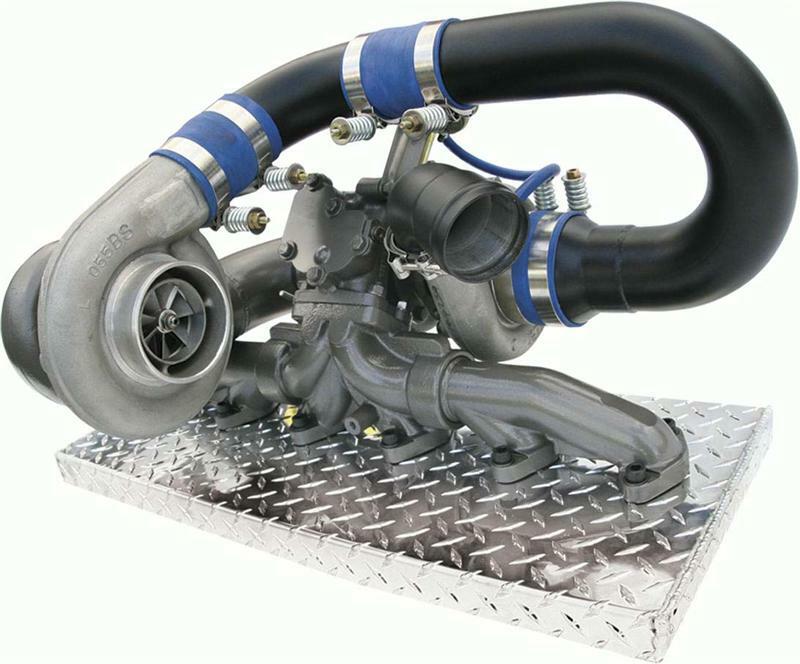 BD’s R700, R850 and R1000 turbo kits contain custom Borg Warner S300 and S400 turbochargers that are designed for engines operating above stock engine RPM and more than 700 HP. Please call in with your engine specifics so we can supply the proper combinations for your application. We recommend that applications with twin turbos utilize one of our intercoolers – only BD Charge Air Coolers are designed to handle the flow and boost pressure created with these fueling and turbo combinations.